I’m looking for an online based solution to have a secure chat. My objective is to send a secure message to someone (single message or a continuous discussion "chat"). No history kept either in the provider’s server or in the browser somewhere. Even if the history is kept on the server the users should not be able to access previous messages. No copy paste options, so even during the chat, the user cannot actually keep copies of the chat contents (*desired feature). Can know who has accessed the chat area, and, how many people are joining at the same time (as most chat software actually do this). Need to log in each time, either with a new username/password or the same ones. Being able to access from a mobile phone is an advantage, either app or web. I’m aware that the user can take a screenshot, or use developers tool to get the chat text from the browser, but I’m looking for the safest options available. Degrees of encryption isn’t really a big deal for me. Mostly will be for novice users. In summary, what I'm looking for is to prevent this scenario: "Parties you’re conversing with may still leak your messages without your knowledge" I realize that they can tell someone else the context of the conversation of course, but, if there are for example long texts, I don't want it to be easily copied/pasted. I tried http://www.chatcrypt.com/. It looks ok in means of each chat session will be separated from the next. But, I was hoping for something more like IP Messenger where you send a single message each time and all previous messages will be disposed, the issue with IP Messenger is that it’s for local network. 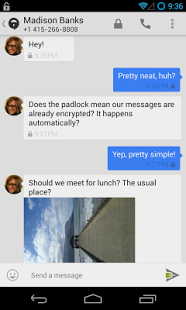 I am using TextSecure for encrypted chat. You can add friends by phone number, but the phone number is only used as an identifier, all data actually goes through WiFi/data. Your messages are not stored on any third-party server. You will have to delete your conversation manually afterwards. As you say, you can't prevent people from leaking your messages, and TextSecure does not even try, messages are easily copyable. You don't have to log in each time. But it is open source, so removing the copy option and deleting messages immediately could be implemented, and presumably not too complicated. If there is no better option. That seems like a somewhat impossible task ( e.g. anyone can screen shot the text and OCR the image quickly on most devices.) I wouldn't even know where to start to stop 3rd party information leaks like this. I would look into the TOX project, as it might meet some of your criteria. At least it provides secure chat connection. About logging in each time, I don't think its a feature in any of the clients yet. But you could submit some feature requests to the developers to include encrypting user credentials (with a password) before saving to disk. There's a relatively new client as well that uses the Tor network to hide the two communicating parties from each other, i.e. it does not preserve any metadata about who communicated with whom. The client is called Ricochet and it's open source. Although user still able to copy-paste the remain chat on normal chat but they also have self destructive message options that make sure your conversation remain confidential which both sender & recipient won't able to retrieve the chat later on. They provide 2 options of security before you can access your account , one with password and the other option you can use lock-with-picture concept they called picture lock. Not the answer you're looking for? Browse other questions tagged web-apps chat security privacy or ask your own question.